Anatomy students recently learned the parts of the vertebral column. The students read an article about paraplegic lifestyles and then they had to brainstorm with a class mate on how their lives would change if became a paraplegic. The students then wrote down questions they had for one of our own GS students that is in a wheelchair most of the time. Zach Waddington is one of our life skill students who has Cerebral Palsy. He agreed to come to Julie Groft’s Anatomy Class, answer student questions and talk to them about his lifestyle. Zach did a wonderful job. Mrs. Horst, his aide, read the questions provided by the students, and he answered them the best he could. His presentation was very enlightening. One thing that Zach told the students made a major impact, “I am a regular teenager just like you, the only difference is I can’t use my arms or legs.” He has an inspiring attitude the students will absolutely remember for a lifetime. 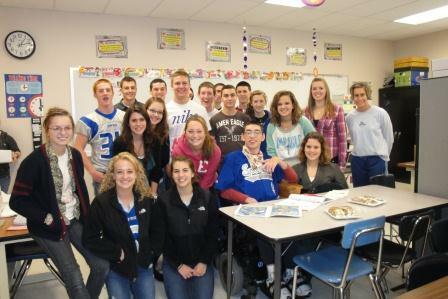 The students wanted to thank him as a class, so they made cards for him, gave him some cookies and a GS baseball jersey. Thanks Zach!